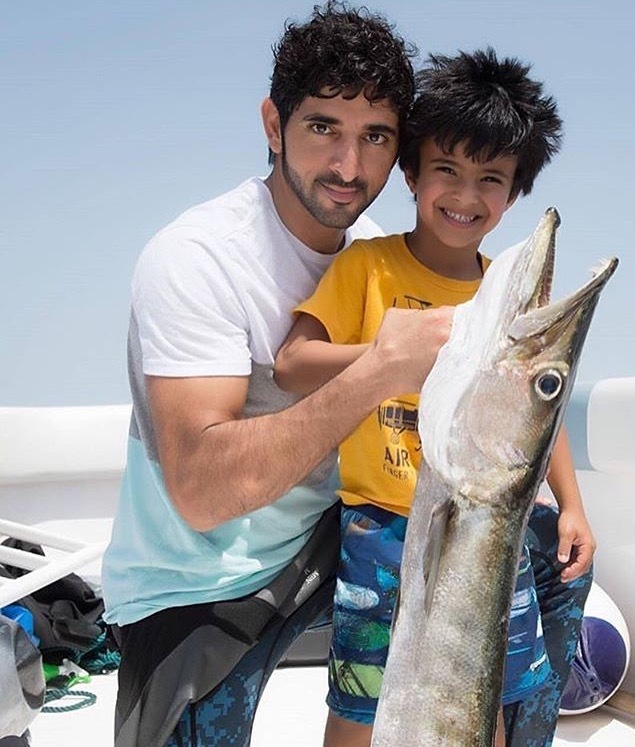 10 teachings from Sheikh Hamdan’s spearfishing Instagram pic. No need for long speeches when your behavior and actions are enough to share your message. In a time when more and more people pretend to be “influencers” and to inspire, the true leaders stand out by being genuine and sincere, acting accordingly to what they say, leading through example without seeking the fame. Anyone can be a role model, regardless of titles or social status. We should seize every opportunity to learn from any situation. But what’s interesting with people who are famous is that when you talk about them people tend to be more concerned and to pay attention. So why not taking this opportunity? Keeping in mind that our best model is the Prophet Mohammad (peace be upon him), once in a while I will shed the light on a personality I appreciate and who inspires me and I will share with you my thoughs and some information that could be beneficial. So let’s start with HH Sheikh Hamdan ibn Mohammed ibn Rashid Al Maktoum, Crown Prince of Dubai, also known as Fazza’. We could easily talk about thousands of his pics and write a book but let’s focus on a single one. Why this one in particular? Because when I saw it I immediately thought about all the knowledge and information that we can get from it. And I wondered if people took the time to analyze and try to understand all the messages a single image can transmit. So there you go, here are 10 teachings from Sheikh Hamdan’s spearfishing Instagram Pic. Emiratis have a strong connection to the sea and they once relied mostly on fishing, pearl diving and marine trade. Fishing is one of many traditions deeply anchored in Dubai’s culture. Dubai’s sea water is considered one of the cleanest in the world and contains a wide range of fish species. You can, of course, visit the well-known aquariums, fish markets and Harbour, the Maritime Museum in Sharjah and you will also get lots of information in Dubai’s Museum. This is part of the history and I think that if anyone wants to have a better understanding of the culture, he/she has to learn more about all those traditions and I am really happy I got to discover this side. So what’s so nice about Sheikh Hamdan fishing and posting it? He reminds the people about this tradition and shows his attachment to it. “Never forget where you come from”. This is one of the wisest advise we can be given because in order to make progress in life, one definitely needs to know where he comes from and to go back to his roots. Being attached to tradition doesn’t mean living in the past, on the contrary, it helps us evolve and improve by taking advantage of all the knowledge and wisdom inherited from the past generations. Remembering and reflecting on their experiences, failures and successes, efforts and struggles. Being thankful for all the accomplishments that now benefit us and hoping we can take over and make sure their efforts still bear fruit. Developing a sense of belonging to a community that makes us strive, not only for our own happiness, but for the people around us. Tradition brings guidance into our lives and comforts us when faced to the uncertainty of an unknown future. One of the main health issue we have to deal with nowadays is the lack of physical activity. Our modern lifestyle tends to be more and more sedentary. We spend time sitting in our cars, or at our desks all day long at work, we take public transports, we can order almost everything on Internet, we spend more time on screens (television, smart phones, computers, etc. ), water arrives directly in our houses, food is available everywhere and we don’t need to go hunting, fishing or picking vegetables. Being a fitness trainer, I often say that I wish my job was useless. Let me explain… We are made to be active, and if we lived the same life as the past generations did, we wouldn’t need to add any physical activity to stay healthy (I am not talking about training because we enjoy it of course). The need to work out is just a substitute to the activities naturally involved in an active lifestyle. So yes, spearfishing is not only a leisure or a way to get food but a wonderful way to stay active. It also shows that we can definitely have fun in a way that is beneficial for our health, far from the screens that invade our lives, and that if we do it with our friends or family we can motivate each other and create a positive dynamic. Now, if you like training and are consistent in your routine, that’s totally fine. But if you can’t train for any reason, just know that there are many ways to stay active on a daily basis and that it can be a starting point. It’s not just about having a gym membership. Walk to the groceries instead of using your car, go for daily walks or bike rides, take the stairs instead of the elevator, do some gardening, play outside with your kids, as long as you move. We are far from being aware of how beneficial it is to be in contact with nature. Should it be sea, desert, forest, mountain, river, whatever, human beings have a biological need to be in contact with nature and it seems to be as important as other health factors such as healthy eating, exercise, sleep or stress management. We are initially made to live in nature which is the most favorable place for our senses, concentration skills, psychological and physical health. It’s not just about how beautiful, peaceful, impressive or silent a place can be. It is much deeper actually. It seems as if nature rekindles an extinguished flame inside us and reconnects us to our prime nature. Like tradition, it’s comforting and beneficial to go back to our roots. Unfortunately, the time we spend in such places keeps on decreasing over the years and we suffer from what we could call a “nature deficiency”. It is important to try and spend more time in nature, regularly, for both our mental and physical health. Whether you go fishing, hunting, playing, or even just walking or sitting. All we need is to reconnect and find the balance between our modern lives and our physiological needs. Overfishing: Around 30% of stocks of the main fish species on the market are overfished, depleted or recovering from depletion and another 50% are already fished to the maximum allowable level. Seasonality: Like fruits and vegetables, fishes have seasons. Those seasons depend on their reproductive cycle. Fishing should happen outside the reproductive season for the fish to be able to renew. But we can find all species of fishes all year long regardless of this concern. Farmed fish: Intensive fish farming has a very negative impact on environment and the quality of the product. Destruction and pollution of ecosystems, genetically manipulated species, use of antibiotics and disinfectants… Moreover the farming of carnivorous species requires enormous quantities of forage fish to feed them. Long distances: We have access to varied species of fishes, all year long, coming from any place in the world. This implies a huge waste of oil and energy and only worsen the lack of resources of our planet. Fish is farmed in one country, then processed in another one and then sent to other countries for consumption. Mercury: Mercury is found naturally in nature but industrial practices such as coal-fired electricity generation or the incineration of waste increases the amount of airborne mercury which ends in lakes, rivers and oceans and is absorbed by fish. Once it gets into the marine food chain, it accumulates, so larger fish are generally riskier to eat. Eating to much of this mercury poisoned fish can lead to various issues such as reproductive and nervous system disorders. Human fetuses exposed to mercury are also at increased risk of neurological disorders. So what shall we do? The best choice is to prefer seasonal and local wild fish, not at risk of depletion nor poisoned with mercury. And if you are the one who fishes, that’s the best way to check that all the conditions are met. One of my favorite books’ tittle is “It starts with food”, and it’s true, food can heal you as it can harm you. Our diet should be a major concern. Too much chemicals, sugar, additives, unhealthy fats, salt, fried food, over processed, over cooked, artificial sweeteners, and much more. And as you know, more (young) people suffer from obesity, cardiovascular and chronic diseases, diabetes, immune disorders, which are directly linked to our modern diet. With the profusion of new diets and tendencies you may not know what to do. People are often confused when asking about my diet (paleo, ketogenic, low fodmap) but it’s individual and I have been investigating for years to know what suits me. But the simplest and most important thing to remember is: eat the least processed food, natural, ideally organic, no refined sugar, no refined grains, no chemicals, local and seasonal is preferred. Simple as protein, veggies, good sources of fat, healthy carbs like sweet potato, rice and others, fresh and homemade meals. Try to know where your food is coming from and if you can grow your own fruits and veggies, go hunting, and yes go fishing and eat on the beach too, or have your own hens. The least intermediaries to your plate the better it is. Whether it is for fishing or on other occasions, we often see Sheikh Hamdan surrounded by the same persons, and at some point I happen to wonder “is he ever alone sometimes?” And this reminds me of the power of community which is an underestimated subject. Once again, it all comes down to our origins and how we were created in the most beautiful way. There was a time when being isolated for a long time would certainly mean death for our ancestors. So they were genetically programed to search the company of other humans and had a natural community spirit. They would live in small groups of few dozens of people. Because of the evolution of society, we tend to focus less on our closed circles and more on our work, on trying to earn our lives, and we are consequently more self centered. We have generally less free time, there are more possibilities to travel and live abroad, there is a growing number of fragmented families, social media also let us believe that we are socializing by making virtual connections… I am not criticizing progress and life choices but we just live in a world that demands more and more from us in many ways, and the social, economical, demographic and even habitat evolutions leave less opportunities to be anchored in a community. We are not talking about spending some time alone, these much needed moments of solitude that enable us to get some tasks done more easily, to recharge the batteries, to take a step back from what surrounds us and finally feel more prone to sociability. We’re talking about social isolation here, the one we can’t hide behind thousands of followers or a busy planning. And it’s not just about the number of people around, sometimes you can be surrounded by people but still feel lonely. It’s about feeling you belong to a group, a community, a family, a neighborhood you are intimately linked with and that makes you feel happy and secure. It can’t be virtual or long distance relationships only, there has to be real interactions and encounters. You surely noticed this little boy who’s never really far, you may even follow him on instagram as I do. Despite the fact that Mohammed Ahmed Jaber is really cute and funny, what is lovable is the place this kid is given. Education is an everyday process that does not happen just by sending your kids to school or making speeches. Our actions and behavior can make us role models without even being aware of it. There are so many ways to learn, many daily experiences to make which is one of the reasons why some people choose homeschooling or even un-schooling. Giving their place to kids not only enables them to learn from us, it also gives them a feeling of security and self-confidence. Sometimes we tend to over protect them and consider they are too young to participate in “adults activities”, but that’s the best way to make them believe they are not worth being trusted because they are not capable while most of the time they are, but WE are simply not ready or even willing to let them. And let’s be honest, sometimes it’s just because people don’t want to bother with kids. I used to be over protective and to do everything in the house to “gain time”. But as a single mom who has to work and teach her home-schooled kids at the same time, I had no choice but giving them more responsibilities because I actually needed their help. And that’s a good thing because they love it, they love being trusted, helpful and doing “adults things”, and I have seen how they have matured and gained self-confidence through those daily changes. Kids must not be put apart and be treated as if they had less value. They must be treated as “future adults in the making”, which doesn’t mean that there are no limits or that we must accept everything. As always, balance is the key. When you’re a homeschooling parent, people often ask about socialization. Actually it’s a false problem because being in a class with 20 children of the same age, sitting almost all day, obeying to one adult, all doing the same activities, is not the more socializing experience and it is not what their adult life will be like, hopefully. Life is made of interactions between people of all ages, backgrounds, positions, roles… we must have the capacity to adapt and feel at ease whoever is in front of us. We are not determined by our age, origin or even physical aspect but by our actions, behaviors, and what we can bring to society so let’s teach our children that we value their opinions, that their have their place in society and that they are useful and much welcome. After effort comes comfort, so let’s eat. Let’s eat on the floor with our hands in the same plate as it is recommended in Islam. The simple fact that our beloved Prophet (peace be upon him), the best model we will ever have, did it should be enough for us to consider it as a good practice, but unfortunately some of us are still reluctant and see it as an uncivilized habit from the past. So now if I tell you that a Crown prince eats on the floor with his hands, sharing food in one single plate, in 2017, what do you say? Is it still uncivilized, humiliating or dirty? Actually eating on the floor with hands is a humble and noble habit that is beneficial not only socially but also physically. It eases digestion, protects the digestive system, promotes mindful eating which helps reducing appetite, cravings, eating disorders and the risks of type 2 diabetes. It also promotes closeness and simplicity. It is not disrespectful or dirty (indeed you always know where your hands have been, not like cutlery), it shows our detachment to what people may think and, last but not least, there are less dishes to wash… I know this one convinced you. I don’t know why we often oppose tradition to modernity. They are linked and we shouldn’t have to choose between the two. Tradition gives you the reason why, the wisdom and experience needed to succeed in the present and anticipate the future so we can definitely be attached to traditions and keep in steps with the times. You can wear a Kandura and at the same time be a pioneer in many innovative ideas in economics, technologies, and much more. I think Dubai’s Crown prince is at the image of what Dubai itself and Emirates’ leaders are in general. And that’s what really impressed me when I traveled there last month for the first time. People tend to focus on the fast development, the buildings, the economy, some even say it’s too much, it’s too quick… So I didn’t expect to see so much attachment to tradition and I loved learning about their history and seeing how they are grateful to their past leaders. I am amazed by how they manage to cultivate this duality. If we go a little further, that’s also the case in religion. Islam is not temporary, indeed it is adapted to any time. It gives us the foundation to face modern situations. And we have in the Prophet (peace be upon him) a role model whose life and behavior can inspire us in every situation of our lives. That’s the reason why this magazine is named “Asriyah”. Because I truly believe that Muslims can be anchored in tradition and modernity at the same time. We know we have to take nowadays challenges because that’s what our religion teaches us. We know our bodies and the world around us are deposits we must take care of, we know the responsibilities we have regarding our children’s education, our families, our neighbors… We know we must take care of the weak and the poor, to fight injustice and oppression, to do everything in the best way possible (itqan). It gives us the reason why and the basic tools. So ecology, healthy eating, active lifestyle, ethical consumerism, positive education, environment issues, all those challenges must be a real concern for us. It’s wonderful when someone’s actions or behavior interpellate people in a way that it can have a positive impact on their lives, should it be only one person. So when this role model is followed by millions of people and transmits such a positive energy we can only appreciate. And as you can see, there were so many subjects to talk about around a single Instagram publication, and we could have covered more subjects (oh by the way, I didn’t mentioned the fact that men can cook…). There are so many things we can learn from people, whether we follow them on Instagram or meet them in our everyday life. We just need to open our eyes and hearts. Do you know someone who is a natural leader? Would you like to share a story? Please feel free to share your thoughs in comments.